War has always been part of the American experience. From the time the first colonists set foot upon North America's shores, they were in conflict with the Native inhabitants. One hundred years later the colonies suddenly found themselves an extension of the conflicts in Europe. Less than a century later, the Revolutionary War freed the fledgling United States from its British overlords and European entanglements. Born and nurtured in war, America grew in strength and power until at the beginning of the 21st century it was the foremost military power in the world. American Wars in American History are examined in this first program on war in U.S. History. 00:02:33Spanish colonies, especially St. Augustine, would be a strategic point in Queen Anne's War. 00:02:52The Treaty of Utrecht ended Queen Anne's War but would set the stage for the War of Jenkins Ear 30 years later. 00:03:22The War of Jenkins Ear would bring colonial militias into the European Wars and eventually lead to the Founding of America and the United States. 00:05:21The French and Indian War produced American war leaders such as George Washington, and in founding America, led to the American Revolution. Chief Pontiac, an America Indian leader, led Native Americans in a war of independence in the old Northwest and Kentucky against British forces and American colonists. 00:02:37The Boston Massacre and the Liberty pole riot jump started the American Revolution and helped produce heroes like Paul Revere in the Revolutionary War. American Wars in American History are examined in this second program on war in U.S. History. 00:02:22Concord and Lexington started the Revolutionary War, after Paul Revere's ride, a heroic act of the American Revolution. 00:02:37George Washington was appointed leader of the Continental Army, while the Battle of Bunker Hill became the first full scale military battle of the Revolutionary War at the beginning of the American Revolution. 00:03:41Washington crosses the Delaware in 1776 establishing George Washington as a true hero and leader during the Revolutionary War, while the importance of the American Revolution is written about by Thomas Paine. 00:03:31The Colonies' Revolutionary War turns around at the Battle of Saratoga, beginning the march to a successful American Revolution built on the backbone of the colonial militia. 00:02:04John Paul Jones fought for the Revolutionary war and helped to make the American Revolution successful by showing the American Navy could fight. 00:02:37From the darkest days of Valley Forge in the second year of the Revolutionary War, the American Revolution and its military leaders like George Washington and Baron Frederick Von Steuben, as well as heroines like Mary Ludwig Hayes - Molly Pitcher - never gave up on the ideal of freedom and as a result, battles like the Battle of Monmouth would be won by the colonies. 00:04:03George Rogers Clark during the American Revolution, the Revolutionary War, led an attack on Kaskaskia at the bidding of Patrick Henry, in order to secure the Old Northwest Territory for the colonies..
American Wars in American History are examined in this third program on war in U.S. History. 00:02:05The U.S.S. Constitution helped set in motion an American Navy and Marine Corps. 00:03:03At the Battle of Tippecanoe, Shawnee leader Tecumseh was defeated by General William Henry Harrison. 00:04:32The War of 1812 produced heroes such as Commodore Perry and Dolley Madison, while Fort Miggs was defended by General Harrison and the White House were burned. 00:02:57In the War of 1812, Francis Scott Key wrote the Spangled banner during the siege of Fort McHenry. 00:01:28In the War of 1812, the Battle of New Orleans was won by Andrew Jackson after the Ghent Treaty had ended the war. 00:02:24Chief Black Hawk, who led American Indians in Black Hawk War, which ended in the Massacre at Bad Axe River, also wrote Black Hawk an Autobiography. 00:04:08The Alamo, would introduce American heroes James Bowie, William Travis, and Davy Crockett, in the fight to free Texas led by Stephen Austin. 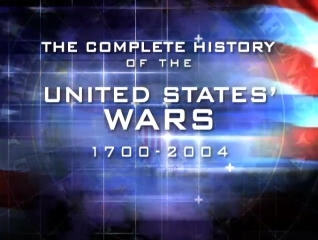 American Wars in American History are examined in this fourth program on war in U.S. History. 00:03:57The Mexican American War, begun by President John K. Polk, was fought to bring Texas into the union and to promote slavery and Manifest Destiny. 00:03:25The Civil War, fought to end Slavery and bring the Confederacy back into the Union was led by Abraham Lincoln. 00:02:54The Emancipation Proclamation, ending slavery during the Civil War, was written by Abe Lincoln, to rally the support of abolitionists later the Union's victory at the Battle of Antietam. 00:03:18During the Civil War, Abraham Lincoln gave his immortal Gettysburg Address. 00:03:21Appomattox, ending the civil war, brought together Confederate General Robert E. Lee, and Union General U.S. Grant. American Wars in American History are examined in this fifth program on war in U.S. History. 00:03:06The Pueblo Indian revolt led directly to the creation of the American Indian horse culture in the 18th century. 00:02:56At the Battle of Little Big Horn, George Armstrong Custer was defeated by Crazy Horse leading northern Indian Plains tribes. 00:02:49The Battle of Wounded Knee, fought t stop the Ghost Dance, happened after the great Sioux leader, Sitting Bull, was killed. 00:03:58The Sinking of the Maine launches American imperialism to take over Cuba, the Philippines, Guam, Puerto Rico and destroys the Spanish fleet and makes the reputation of, Teddy Roosevelt. 00:04:53World War I begins but President Woodrow Wilson keeps America out of War until the Arthur Zimmerman telegram demonstrates Germany's involvement in North American politics. 00:04:12During World War I, America's Selective Service Act, drafts men to fight against Germany; and from this war, heroes, such as John Black Jack Pershing and Eddie Rickenbacker, would emerge, as well as the call for League of Nations, created by President Woodrow Wilson. American Wars in American History are examined in this sixth program on war in U.S. History. 00:05:10After Japan attacks Pearl Harbor, destroying the airfield and naval base at Pearl Harbor, Franklin Delano Roosevelt declares war and Douglas MacArthur vows to return to the Philippines. 2.) 1944 - D-Day "Operation Overlord"
00:04:16D-Day, known as Operation overlord, began the fight in western Europe against fascism and pitted American Generals like George S. Patton and Dwight David Eisenhower against German militarists such as Erwin Rommel, in a war that began for America at Pearl Harbor and was led by Franklin Delano Roosevelt and created The Greatest Generation of Americans in the 20th century. 00:03:56Hiroshima and Nagasaki, were the only targets of the Atomic bomb developed by Manhattan Project, led Robert Oppenheimer, and used to end the Pacific war in World War II. 00:03:22The Korean War, during the administration of Harry Truman, pitted the west against communism as Korea's Communist North Korea fought the capitalist South Korea. American Wars in American History are examined in this seventh program on war in U.S. History. 00:02:46The Marshall Plan was developed after World War II by George Marshall, and was used to save Europe from Stalin and Russia, though a Cold War developed, which created an Iron Curtain across Eastern Europe and a Western Europe protected by NATO. 00:03:52The Cold War, started under Harry Truman, was continued by cold war warriors John Foster Dulles and Eisenhower, eventually resulting in a stand against communism in the Vietnam War. 00:03:56The Cuban Missile Crisis pitted John Kennedy against Khrushchev and Fidel Castro in America's cold war fight against, communism. 00:04:24America scaled up the Vietnam War with the Gulf of Tonkin Resolution proposed by Lyndon Johnson to fight communism and the Viet Cong. 00:03:51The Vietnam War's Tet Offensive would mark the end of U.S. begun by Lyndon Johnson, and the rise of Communism begun by Ho Chi Minh. American Wars in American History are examined in this eighth program on war in U.S. History. 00:04:05With Vietnam and the Vietnam War causing protests at schools like Kent State, shootings occurred as the anti communism fervor of the cold war came against the civil rights of protest, eventually civil rights winning out with the Elsberg Papers. 00:02:40Grenada, a hot spot in America's cold war against communism, helped Ronald Reagan promote the U.S. Military, and ten years later the ouster of Manuel Noriega from Panama would demonstrate American military superiority. 00:04:06The Gulf War pitted Iraq, governed by Saddam Hussein, against America, under by George Bush, and in the war, Iraqis were defeated by a coalition under the command of General Norman Schwarzkopf. 00:02:33The Cold War, ended with the defeat of communism when America led by Ronald Reagan defeated the USSR led by Mikhail Gorbachev. 00:03:25Using the reason searching for Weapons of Mass destruction, George W. Bush and the Neocons led the United States into the Iraqi war.